When you have multiple debts to tackle at once, using a personal loan to consolidate your debts and pay them off can be a logical solution. Not only can it help you streamline your monthly payments, but it can help you save on interest charges over time if you are able to pay the loans off more quickly or secure a lower interest rate. Personal loans are generally unsecured installment loans. Meaning, you can borrow money without having to put up anything as collateral and then pay off the loan in fixed installments over time. They come with fixed interest rates as well, which are automatically calculated in your monthly payments and won’t change over time. You can use the money from a personal loan for almost anything, including paying for a wedding, emergency car repairs or medical bills. However, debt consolidation could be one of the more financially responsible uses. In this post, we’ll explain everything you need to know about personal loans. Depending on your credit history, credit scores and other factors, you may be able to get approved for a lower interest rate than you’re currently paying on your debts. If you take the lower rate and a shorter loan term, or keep the same loan term, then you can save money over the lifetime of your loan. If you’re approved for a much lower rate, you may be able to save even if you choose a longer term. A lower rate is one way to save money with a personal loan. You may also find it easier to manage just one monthly payment when you consolidate with a personal loan, and find yourself paying the loan off more quickly than you would if you still had multiple bills to track. Of course, paying off debt more quickly only leads to more savings on interest. If you’re using a personal loan to consolidate your debts, you’ll have fewer bills to manage each month. Having fewer bills can save you time and might relieve some bill-related stress. Also, you might be less likely to forget a bill and wind up paying a late fee. If your loans currently have a variable interest rate, you may worry that the interest rate and your monthly payments could increase in the future. Taking out a fixed-rate personal loan lets you lock in a rate, decrease your interest rate risk and help you budget for the future knowing your monthly payments will typically stay the same. Some loans require you put up collateral to borrow money. For example, an auto loan uses your vehicle as collateral and a mortgage uses home is the collateral. There are also secured personal loans that use money in a savings account or certificate of deposit (CD) as collateral. However, you may be able to take out an unsecured personal loan and use that to consolidate debts. The advantage of having an unsecured loan is that you don’t have to risk any personal property. Although falling behind on payments could hurt your credit and lead to additional fees, the lender can’t take away your vehicle or home like it could with an auto loan or mortgage. Consolidating your loans can impact your credit utilization, one of the most important factors in determining your credit score. Credit utilization is the amount of credit you’re currently using compared with your overall credit limits on revolving accounts. Revolving accounts could include credit cards or lines of credit, but don’t include installment loans. If you’re using a personal loan to consolidate debt from revolving accounts, and you leave those accounts open, you’ll be lowering your utilization rate. Although your overall debt doesn’t change, the type of debt changes and your scores could improve as a result. Although you can use personal loans for a wide variety of expenses, your loan agreement could forbid you from using the money to repay some types of debts. For example, you may not be able to use a personal loan to repay your student loans. If you want to consolidate or refinance those, you might have to work with a student loan refinancing company. Although an unsecured personal loan could limit your risks, you might be able to save more money by consolidating your loans a different way. For example, some credit cards offer a 0 percent introductory rate on balance transfers, which could let you avoid interest completely while paying off the debt. Or, a secured loan, such as a home equity loan, might offer a lower interest rate than you could get with a personal loan and your interest payments might be tax deductible. After using a personal loan to pay off a revolving credit account, you may now have a large credit limit available. If you start using the credit lines without having a way to pay the bills in full, you could wind up back in debt on those accounts in addition to having to repay your personal loan. Many lenders charge origination fees on personal loans, which are typically a percentage of the total loan amount. That fee is often deducted from the total loan amount, which means you could wind up getting less money than you need. Be sure to factor in the origination fee before you make your loan request. And definitely compare loan options from different companies. It’s possible that you’ll find a lender that charges no origination fee at all. When should you consider a personal loan for debt consolidation? Whether you’re consolidating multiple loans, or taking out a personal loan to replace a single debt, it may only be a good idea if you can get approved for a lower interest rate. Otherwise, you might end up paying more interest over the lifetime of your loan. Before taking out the personal loan, also look to see if there will be an origination fee on the loan and if your current loans have prepayment penalties. Either fee could make consolidating your debts with a personal loan less appealing, but calculate the overall costs as you might still come out ahead. In some cases, saving money may not be as important as managing your cash flow. Choosing a personal loan with a long repayment term could decrease your monthly payment amount, which makes it easier to afford all your monthly expenses. Ideally, you can lower your monthly payment and save money on interest at the same time. But even if you can’t save money, decreasing your monthly payments could be a better option than missing payments and hurting your credit or having to pay fees. Before taking out a new loan and consolidating your debts, you may want to sit down (perhaps with a financial adviser or credit counselor) and make a plan for how you’re going to pay off your loan. If your original debts were the result of a one-off experience, such as a medical emergency or lost job, you may not find it difficult to follow through with the plan. However, if you’ve taken on debt due to consumer purchases, you may need to change your habits in order to pay off the loan without ending up in even more debt. Those who don’t think they’re ready to make the necessary changes may want to consider a debt management plan from a nonprofit credit counseling organization rather than a personal loan. Getting approved for a personal loan isn’t a guarantee. Lenders may want to review your credit history, credit scores, income and monthly expenses, and each may have different requirements. You may also need to meet their basic eligibility requirements, such as being at least 18 years old, a U.S. citizen or permanent resident, living in a state where the lender offers personal loans and meeting the lender’s minimum income or employment requirements. Other factors, such as your credit scores and debt-to-income ratio, might influence your loan’s interest rate, term options and how much you can borrow. Lenders may have minimum requirements that you’ll need to meet or exceed to get approved, and generally, the higher your credit scores and the lower your debt-to-income ratio, the better your loan’s rates and terms. What interest rate can you expect? The interest rate you’ll receive can depend on the lender and your creditworthiness. 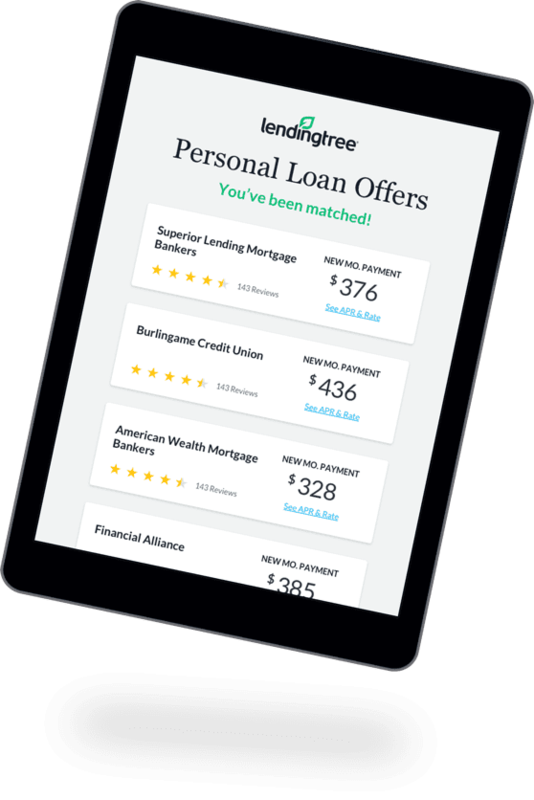 Rates offered by lenders through the LendingTree personal loan marketplace range from 5.99% to 35.99%, but many lenders charge rates several times that high — especially lenders that work with borrowers who have poor credit. That’s one of the reasons it’s so important to shop and compare loan offers first. Having a higher credit score can certainly pay off, as a lower interest rate may be able to save you a lot of money over the lifetime of the loan. For example, someone with a FICO score over 760 who borrows $10,000 with a four-year term might pay $1,759 in interest. By contrast, someone with a score of 580 to 639 might pay $7,288 in interest, a $5,529 difference. 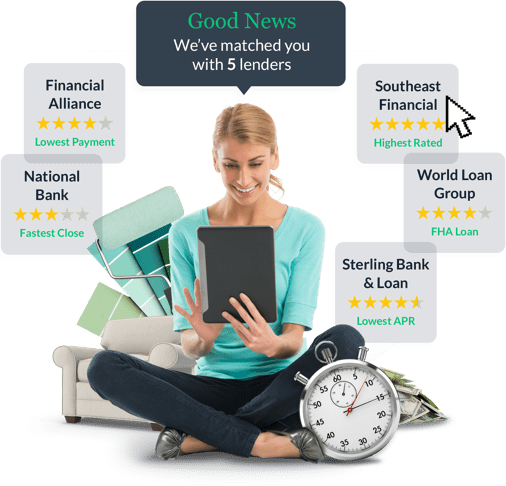 Whether you have poor or excellent credit (or something in between), comparing lenders could help you find the lowest possible interest rate for your loan. Since lenders consider factors differently, the lender with the lowest advertised rate on its website might not be the one that offers you your lowest rate. In fact, a LendingTree study found that even those with excellent credit may be offered a wide range of APRs on personal loans — from 7.55% APR to 16.38% APR for a $10,328 three-year loan. In this case, shopping around and finding that low-rate loan could save the borrower over $1,500 in interest. Shopping for a personal loan and comparing your rates and terms may be even more important for those with lower credit scores. Applicants with good credit had a larger APR range than those with excellent credit, and those with fair credit who don’t shop around wound up paying more for additional costs. For example, some lenders may charge higher origination fees to borrowers with poor credit, while others won’t charge an origination fee to any borrower. There are many ways to consolidate your debts, and a personal loan might not always be the best fit. A balance transfer credit card is a card with a 0% intro APR that applies to balance transfers, and sometimes to purchases. You can transfer your debts to the card and then pay down the credit card debt without accruing additional interest during the introductory period. A home equity loan (HEL) is a secured loan that uses your home as collateral. You may need to pay a variety of fees before you can take out a home equity loan, including processing, appraisal, origination, underwriting and funding fees. Also, your maximum loan amount will depend on the value of your home and how much equity you currently own. However, even after taking the fees into account, you might wind up with a lower rate than you’d pay with other types of loans. Excessively high rates if you have poor credit. You might wind up in more debt if you don’t manage your spending. You might not get approved for a high enough credit limit. The minimum payment amount may not be enough to pay off the debt before the introductory period ends. False sense of debt freedom may lead you to continue racking up more debt with your new card. You have to use your home as collateral and risk foreclosure if you default on payments. Closing costs can be expensive. Unsecured personal loans don’t require collateral. Have a fixed monthly payment and know your loan term upfront. Able to use for multiple purposes, from debt consolidation to wedding loans. You could avoid paying interest during the introductory period. Might offer a lower interest rate than other types of loans. Interest payments may be tax deductible if you use the funds for home improvements, or to build or buy a home. Those who have multiple types of debt that can’t easily be addressed with a balance transfer. Those with good to excellent credit and a high income. Or, those who don’t have a lot of debt to consolidate. Those who have an emergency fund will benefit from the tax deduction and are certain they can meet their payments.